The full moon shines bright in this picture, though looking smaller than it appears through the eye. The city sky and the clouds show amplify the hazy brightness. The leafless trees are also illuminated, but unnervingly and unnaturally from the wrong side. They were illuminated by street lights, which was amplified by the long exposure. 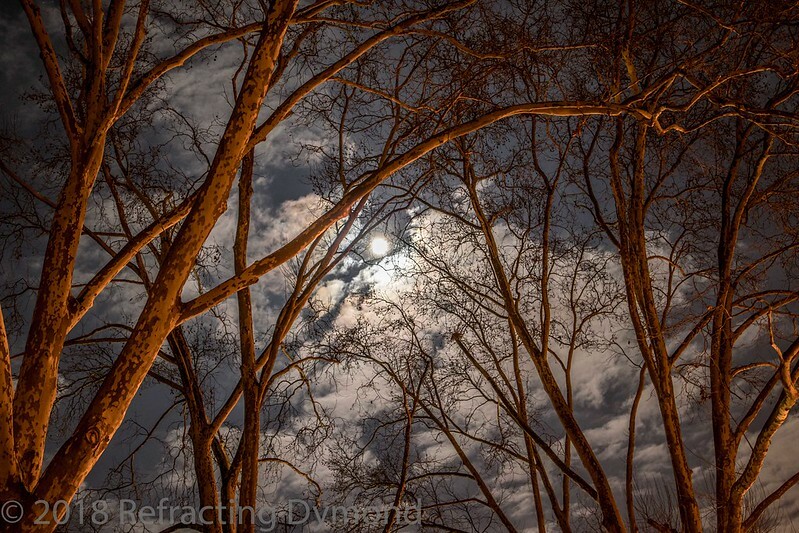 It was challenging to get an exposure that didn’t overexpose the moon too much, yet showed the details of the trees. After trying many different exposures, without bracketing and editing, I decided that this was the best look – the moon still overexposed but in a way that shows its brightness in the sky. I wasn’t able to post over the past year because 2017 posed quite a challenge. The biggest time commitment was obtaining professional certification. It was hard and time-consuming, but I am glad I had the opportunity to do it. I am also glad that it is done, and I have time back to focus on creative projects. Below you can see I have added a Canon 80D. I was excited to try out the camera, but didn’t have any good ideas on what to photograph. Walking around town, I noticed the moon through the trees and sense the opportunity. I played around with the settings for quite some time, even though I had been using a Canon 600D, the controls did take some getting used to. I was so happy at the results. I am going to have a lot of fun with this camera and I hope you enjoy the results. This shot makes me feel as though I am among the scene.